Richard Comley was virtually unique among demolition men: a curious mix of studied expertise that made him the envy of his peers; and a boyish enthusiasm that made him seem like you’d known him all your life. 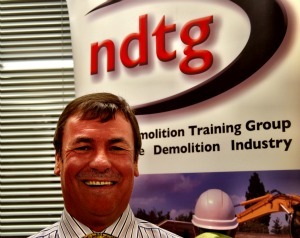 The fact that ill health prevented him from becoming chairman of the National Demolition Training Group was a blow; the fact that illness has caused his untimely passing will impact right across the UK demolition industry. Demolition will be a less cheerful place without him. A trip to CG Comley & Sons’ premises in Hampshire was less like visiting a demolition company and more like being invited into Richard’s family home: his devoted wife Julia sat just a few feet away answering telephones and keeping Richard’s boundless sense of humour in check; his son Toby tucked around the corner running the asbestos wing of the family business. My thoughts are with them, and with Toby’s sister Jennifer at this time. Nowhere were the two sides of Richard’s personality more clearly illustrated than at an Institute of Demolition Engineers event. A regular volunteer behind the IDE merchandise desk, he was always first with a joke and a laugh. Inside the auditorium, however, he was all business, studying new legislation with an almost professorial vigour to ensure that he and his fellow IDE members stayed one step ahead. Although I spoke to him several times since, I last saw him at the IDE AGM at which Steve Jack was named the new president. Not only was he displaying no visible signs of illness, his sense of humour seemed somehow heightened and he was on fine form. But then, he always was. In a dog-eat-dog industry, Richard was one of the good guys: generous; funny; knowledgeable; and thoroughly decent. CG Comley & Sons Ltd is trading as normal. Posted: June 11th, 2013 under General.